Hi all, What a nostalgic site this is for all of us “Watfordians” from decades past, no matter where we live now ( me in South Australia) I’m sure our thoughts often wander back in time to our childhood days in what was then a very different town. I used to work as a schoolboy at the Watford Central Market at Toy Gurney’s fruit and veg stall opposite the Cawdells side entrance. Under cover we may have been but the snow and rain still found somewhere to get in. My Saturday began around 7am and I was normally busy sorting out the sprouts, spuds and deleafing caulies, these were sometimes covered in snow and my fingers used to be so cold. My mum made me sit in front of the fire after my bicycle journey home in the dark and my fingers used to thaw out too quick and ached…. chillblains? For breakfast at the market Tony used to give me half a crown on top of my one pound wages to get a good breakfast, the little take away stall near the back exit/entrance was my favourite venue and I always had an omlette sarnie with brown sauce and a mug of hot tea to start the day. At lunchtime I was tasked with taking the empty banana boxes down the hill to Ffyths Banana depot, on one of the markets two wheeler carts. On the way back I had sit-down, fish and chips at the little shop opposite Ffyths, which were absolutely delicious. Sometimes in the school holidays I went to Covent Garden Market in Mr Gurneys old blue “Commer” van in the early hours of the morning to buy the stock for the week, it seemed such a long journey there and back and I was pretty tired for the rest of the day. Does anyone remember Tony’s dad? Does anyone remember Tony’s dad, he always wore a straw boater at the Watford football matches, he would climb up a pole and try and get bets on the score. I think he was a bit of a character and didn’t mind a drink? When I left the market I joined the staff at North Watford Sainsbury’s, this was pre super market times and I learnt so much about all the different products…. another story maybe. This page was added on 29/04/2013. Please, can anyone remember the name of the little flower shop behind the Market when it was behind Cawdells? Just to let you know jImmy fox is still alive. Visted the new watford market the other day. Sorry to say its awfull. This comment is more for Henry Boyce, I do not remember you, but you mentioned one person I remember “Jimmy Fox ” the green grocer, me dad often took me to the market and he and Jimmy Fox knew each other from the war years together! I also remember Dorothy Heathcoat ( spelling not sure?) she had a flower stall, as a young child I helped make moss wreaths for her! Dad and I always went home with flowers for mum, and a couple bags of fruit and veg! Dad always chose unusual fruits, because he spent time in India during the war years, and lots of curries… ” You only drink beer, with a great curry” Finishing off our trip, just by the entrance, Welks, Winkles etc in vinigar, delicious! This shopping with my dad after we went the football game… Listening to the moans and groans of the crowd… Hasn’t changed much! My brother wasn’t interested and as the eldest child I felt just a little more special on Saturdays… I was born in 1950, and unfortunately, I have a great memory, and they’re all great! My brother, sister and I felt so safe and important, growing up in Watford was a truely special time in our lives..
Poor old staunch was carted of in an ambulance. not forgeting Betty white and her husband Danny who rumour has it knew the krays. Like i said early i was the only black kid working in the markrt at that time,i never once came across racism from customers or stallholders they were good people who didnt care about what colour you were as long as you could take a joke and didnt mind getting your hands dirty. i remember my first sat,job in the old watford mkt i work for g.h, brown and sons. iwas still at school and work tues after school,fri before and after school and all day sat. Some of you will remember len brown standing at the end of the stall shouting KENT strawberries or what ever the bargin of the day was.Sometimes when a customers brought to much shopping i would carry it over to they car for them,which was normal parked behind the old rose and crown. i loveed doing this as i would always get a tip anything from one shilling to half a crown every now and again id carry there shopping to the top of the town to the car park oppisite the odeon cinema buy the side of gade house. Then it was straight of to GARDNERS bakery on the corner of CLARDEON RD to stuff myslef full of cakes. During the day in the market we stacked all our rubbish on to a barrow once it was full i would take it up to a dustcart at the top of the market near lotus lane. My route would take me past the butchers stalls B.Fox Mills meat and of course Gibsons who had two stalls. Then left up the alley way that ran between B.H,S, and the market passing Jeff harris carpet stall South holland blub co, and the tea stall where id stop for a quick bottle of hubbley bubbley or was it Creasta. On the way back it was striaght down the Cawdells arcade passing Mr gurneys stall the only greengrocer in the arcade. The funniest thing i can remember about that market is late saturday afternoons all the tramps and wineos use to come to the tea bar there was a really tall man we called staunch a lady called tory and an old boy who sometimes had advertising boards plus soome more. Any way they were a bit worse for wear and the police were called to move them on. As soon as staunch saw the police he stood up and shouted. YOU,LL NEVER TAKE ME ALIVE. then tripped over a chair and knocked himslef out. 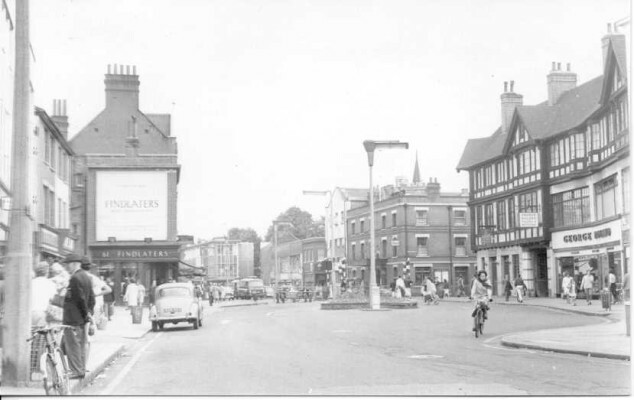 I lived in Watford from 1952-1963. We returned to the UK after several years in Germany (where I was born) and originally lived with my Grandparents in Addiscombe Road before moving to Tavistock Road, North Watford where I attended Knutsford CP and then on to Rickmansworth Grammar School until 1963. I have fond memories of my many part-time jobs as a teenager including helping a friend Ronnie Thomas on Eddies Shoe stall in Watford market, delivering the “pink un” football results Evening Standard, selling Walls Ice Cream via a tricycle. My brother and I used to frequently travel the whole London Transport network via the “Rover” tickets when we went bus spotting. A couple of times we missed late night connections and were brought home by the police !! How lovely to read all those stories, it really took me back in time to the good old days when I was a teenager in Watford. Especially as I live abroad (Bavaria,Germany) and have hardly any contact now with Watford. Like most people I had various Saturday jobs like at Timothy Whites, Littlewoods and as an usherette at the Odeon which was great fun watching films four or five times! Once we had a Western and they sent along Indian costumes to promote it, so I had to wear this and say hello, Indian style, to everyone coming in! There’s even a photo of me wearing it at the car park at the back of the cinema. Those were the days – going to Top Rank on the lookout for a good looking lad – didn’t work out – found one here. I lived in Cobb Green Woodside and went to Francis Combe from 1960 to 1969 where I left for Germany and have been here ever since. My sister worked at Clements which was classed as quite posh in those days. It’s a shame it’s all gone and that flyover – how could they? My grandparents (Mathews) were from Oxhey and had a little shoe shop in Villiers Road. As I live abroad I greatly appreciate these stories and this site so please keep them coming in.